As modern day direct impingement and piston operated ArmaLite style rifles continue to evolve, so too have the demands of their ammunition. This Prvi Partizan 69 grain .223 Hollow Point Boat Tail Match ammo is the intersection of where affordability meets high performance, and will surpass your every expectation. 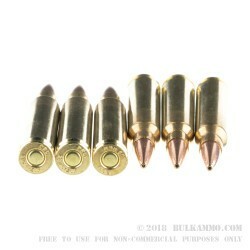 This bulk 69 grain hollow point boat tail round is the preeminent round in long distance shooting. The non-expanding hollow point cavity creates a streamlined supersonic envelope of air around the bullet in flight, and the boat tail recess on the end of the round stabilizes the bullet in flight by mitigating yaw and other directional forces from manipulating the bullets flight path. Precision grade propellants ensure a consistent muzzle velocity and shot placement, and the solid copper brass cartridges are some of the finest in production today. Perfect long distance competition, Prvi Partizan 69gr .223 Hollow Point Boat Tail Match is truly a wonder to behold in flight. 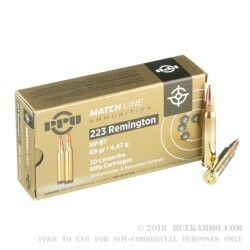 For long range shooters who have come to expect more out of the ammunition, the Prvi Partizan 69gr .223 Hollow Point Boat Tail Match is the ideal round for you. Q: How many ft per sec? A: Hello Michael! I appreciate you reaching out to us about that ammunition. Prvi Partizan lists the muzzle velocity of this round at 2855 fps. 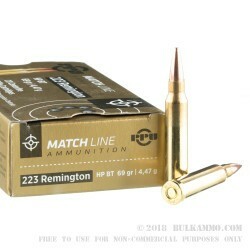 The listed muzzle energy of this round is 1249 ft lbs.